Once thought to be just a messenger that allows genetic information encoded in DNA to direct the formation of proteins, RNA (ribonucleic acid) is now known to be a highly versatile molecule that has multiple roles in cells. It can function as an enzyme, scaffold various subcellular structures, and regulate gene expression through a variety of mechanisms, as well as act as a key component of the protein synthesis and splicing machinery. Perhaps most interestingly, increasing evidence indicates that RNA preceded DNA as the hereditary material and played a crucial role in the early evolution of life on Earth. This volume reviews our understanding of two RNA worlds: the primordial RNA world before DNA, in which RNA was both information store and biocatalyst; and the contemporary RNA world, in which mRNA, tRNA, rRNA, siRNA, miRNA, and a host of other RNAs operate. The early chapters of the book analyze the role of RNA in the first life forms and the appearance of cells. Subsequent chapters examine riboswitches and ribozymes, establishing what the RNA molecule is capable of alone. 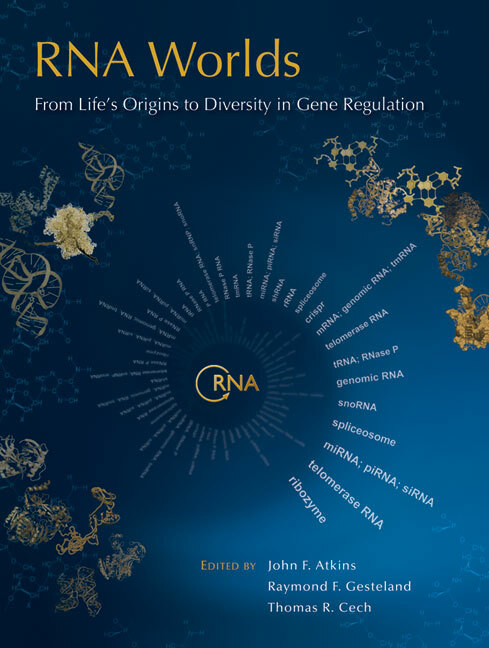 The book goes on to discuss the evolution of ribosomes and the functions of RNPs, before reviewing the recent work that has revolutionized our understanding of gene regulation by non-coding RNAs, including miRNAs and siRNAs. Also covered are viral RNAs, telomerase RNA, and tools for scientists who work on RNA. The book is thus essential reading for all molecular biologists and biochemists, as well as chemists interested in RNA technology, information storage, or enzyme catalysis.